The American Standard Champion 4 toilet model is one of the best selling flushing toilet series in the world. Past users have high praise for this toilet model and highly recommend it. In this American Standard Champion 4 Max reviews, we’re going to compare two toilet models from the Champion 4 series. These are the Champion 4 Max tall height elongated bowl toilet and the Champion 4 tall height round bowl toilet. These toilets have a lot of similarities as we will find out later, but they also differ in one way or another. Note: American Standard Champion 4 and American Standard Champion 4 Max isn’t the same toilet. You can also read this Champion 4 VS Champion 4 Max article to find out the difference between them. The Champion 4 max tall height toilet is made of durable vitreous china material and has an EverClean surface. It features the champion 4 flushing system with 4-inch piston action accelerator flush valve. The toilet uses 1.28 gallons of water per flush; it is ADA compliant and comes with a 10-year warranty. If you’ve been looking for a toilet with an effective flushing system and one that is easy to clean, then the champion 4 tall height toilet model will be a great choice for you. 2.1 Summary: Why buy Champion 4 max tall height Elongated toilet? 3.1 Summary: Why buy champion 4 max tall height Round toilet? 4 What’s the difference between these two toilets? If you’re not worried about your bathroom space, the Champion 4 max tall height elongated toilet will be a great option for you. 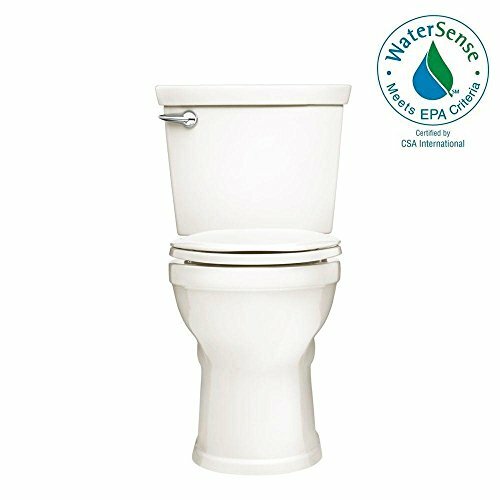 This two-piece toilet comes with a tall height bowl for easy sitting and standing by adults. The seat is very comfortable and slow closing. So, there is no more slamming of the toilet seat. Furthermore, the Champion 4 Max tall height toilet features the powerful champion 4 flushing system with a 4-inch piston action accelerator valve. This ensures that all the contents in the bowl are cleared in just one flush and the everclean surface ensures that the toilet bowl remains sparkling clean. The toilet has the highest bulk removal rating of 1000 g, which can flush almost anything. It is also important to note that this is a high-efficiency toilet as it is WaterSense certified and only uses 1.28 gallons of water per flush. Therefore, you will end up saving water or getting a rebate if your state provides one. The toilet is ADA compliant as it has a bowl height (without seat) of 16.5-inches and the trip lever is located on the left front. So, it can be installed in restrooms and public areas. On top of that, the buyer of the toilet gets a 10-year warranty. Summary: Why buy Champion 4 max tall height Elongated toilet? Many users have reported that the toilet tends to crack near the toilet handle after some time of use. The Champion 4 max tall height round bowl toilet model is ideal for people with smaller bathroom. This toilet is more compact than the first one but with many similar features. Similar to the bowl toilet, this model is as well made of vitreous china material. It includes a bowl, tank, toilet seat with cover, trip-lever, bolt caps, speed connect tank-to-bowl coupling kit, and wax ring. The toilet is very powerful and clears waste in just a single flush. This is thanks to the champion 4 flushing system and the 4-inch piston accelerator flush valve that make sure nothing stays behind after every flush. The toilet also features the everclean surface which inhibits the growth of stain and odor-causing mold, mildew, and bacteria. As a result, the toilet remains ever clean and shiny. With a bowl height of 16.5” without a toilet seat, this toilet is of a chair height, making it great for almost all people to use. That’s why it is ADA compliant as it also has the trip lever on the left front. The toilet utilize only 1.28 gallons of water per flush, thus it is eco-friendly. In addition, the toilet is EPA WaterSense certified, so, it can be installed in any state in the US. Summary: Why buy champion 4 max tall height Round toilet? What’s the difference between these two toilets? This is the clearest difference between these two toilets. The first toilet features an elongated bowl design while the second one has a round bowl design. The round bowl is great for smaller bathrooms while the elongated bowl offers more comfort to the user. The trapway diameter of the Champion 4 Max elongated bowl toilet is quite smaller when compared to that of Champion 4 Max round bowl toilet. The former has a trapway diameter of 2.12-inches and the latter has a diameter of 2.375-inches. Another difference between these two similar toilets is their total weight. Champion 4 Max elongated bowl toilet has a weight of 104lb, while the round bowl toilet has a weight of 85lb. Last but not least, the Champion 4 elongated bowl toilet has a depth of 30.25-inches, while the round model has a depth of 28.25-inches. Champion 4 max tall height toilet model offers exceptional performance and it is very comfortable to use. It is made of a long-lasting material in vitreous china and the everclean surface ensures that your toilet remains clean most of the time. If your bathroom is small, then you’re better off with the round bowl toilet design, while if you want comfort and have a large bathroom, the champion 4 tall height elongated bowl design will be the most ideal. I have explained everything in this American Standard Champion 4 Max reviews article that you should know. Question: What does “Everclean” surface mean? Answer: The Everclean surface is the silver-based, double coat surface which prevents the development of stain and odor causing mold, mildew, and bacteria. This surface can be found on most American Standard toilets, and it keeps the toilets extremely smooth like a mirror, making it simple to keep clean, even after many years of use. Question: How do I locate my toilet model number? Answer: This is a very simple exercise. Simply remove the lid on your toilet tank, and put it gently on the floor. Then, you will see a four-digit number located on the back of the tank, just close to the water level mark. This is the model number of your toilet. To know if your toilet is one-piece or two-piece, look at the number it starts with. If it’s a 2, then it is a one-piece toilet, but if it’s a 4, then it is a two-piece toilet. Still, have a question after reading this American Standard Champion 4 Max reviews? Comment below.